From learning music through his family to becoming a Grammy Award™ winner in the group Tavares, R&B singer Chubby Tavares has a gift for singing, songwriting, and performing. Learn more about his solo album and his success. 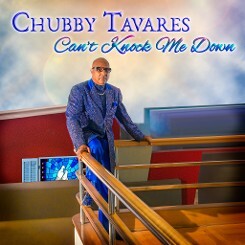 Chubby Tavares released his new solo album Can't Knock Me Down last year. Best known as the signature voice for the band Tavares, this powerhouse band included many of his brothers. Working together for more than 40 years, they garnered many music industry accolades, including a Grammy Award. In 2012, Chubby embarked on a solo career. In 2013, he met Preston Glass, and together they completed this new CD. The song, Can't Knock Me Down, co-written by Preston Glass, Fred Pittman, and Chubby Tavares is a moving piece performed by Chubby about losing children to senseless acts of violence, but it also encourages people to come together to create change. Chubby's mentor Marvin Gaye once said, "Jesus left a long time ago, said he would return / He left us a book to believe in / In it we've got a lot to learn." As Marvin's music inspires more generations to greater heights, so does the new work of Chubby Tavares. Listen to a song, review some videos, and then purchase his music. Tell your friends and share links to spread the news about this exciting new solo project.